An opportunity for escape presents itself to Dragon and he breaks loose of his cell and fights his way through numerous guards, all dressed the same as the police officers that had arrested him. His progress is cut short when a large super-freak named Droog intercepts. This behemoth unleashes a powerful continuous mental blast that eventually wears down Dragon. Bedrock gathers up the fallen hero and carries him back to his cell before throwing him inside. Dragon begins a long rant which Madman is forced to listen to, commencing with how messed up his cellmate’s world had gotten before the end. He talks about how DarkLord had killed people that were close to him, prompting him to kill him, creating this war-torn reality. Dragon considers that with the Nega-Bomb having wiped out almost everyone else’s superhuman abilities that he could have gotten a rest finally. There were few threats left that he would have had to deal with and could have enjoyed a new life after mourning the loss of his loved ones. Dragon then questions why Madman is not even trying to escape and is informed that he and the Atomics have nowhere to go. Their hometown of Snap City had been completely destroyed by the Martians and they are all that remains. 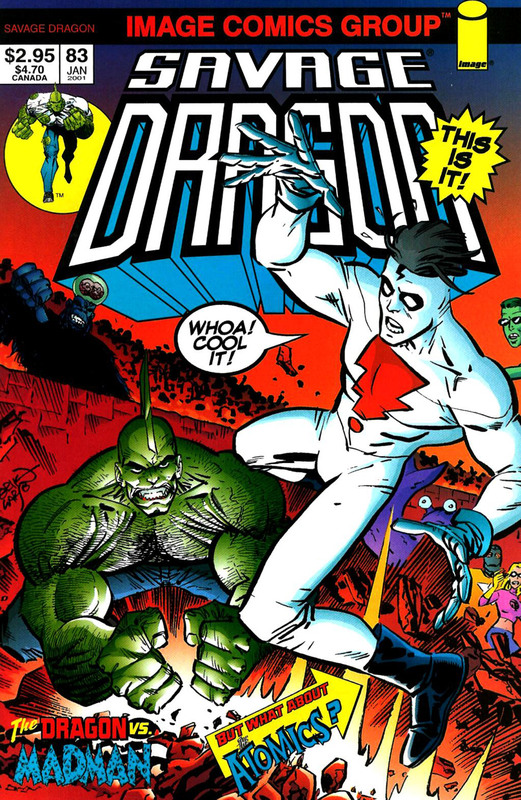 Some time later, Badrock and Barbaric are dispatched to bring Dragon out to the gladiatorial arena and he passes a number of other cells in this facility named Command D. He questions why the Atomics and the other super-freaks are so passive but figures that they are under some kind of mental-control. Dragon’s healing factor must have fought off any other outside influence and he alone remains desperate to escape. Dragon arrives at the Arena of Death and notices that BrainiApe is Australia’s premier, explaining why the police appear to be dressed as Nazis. He is horrified to see that Guy Masters has been thrown into a death duel. Dragon watches his new friend get killed during the fight which sets him off, casting aside his captors and racing to Guy’s side. Dragon is unable to bring his friend back to life and so begins berating the crowd for their bloodlust. In a surprising move, BrainiApe leaps from the stands to directly attack his prisoner but when he punches Dragon in the face, his blow is barely felt. Dragon shrugs off the attacks of BrainiApe and decides to try to defeat him, hoping that the Australian public will declare him their new leader. He looks set to win this battle and points out that BrainiApe really should have had Badrock or Barbaric attack him instead as they are far more physically formidable. Dragon is then alarmed when BrainiApe suddenly changes shape into Madman, indicating that he had been under some kind of telepathic influence. This ruse was out of the range of BrainiApe’s abilities and so Dragon scans the crowd looking for someone he suspects could be a telepath. He leaps into the crowd to knock out one of the audience but this is quickly proven to be a mistake. The Atomics launch an assault, under the same mental enslavement as Dragon had been.